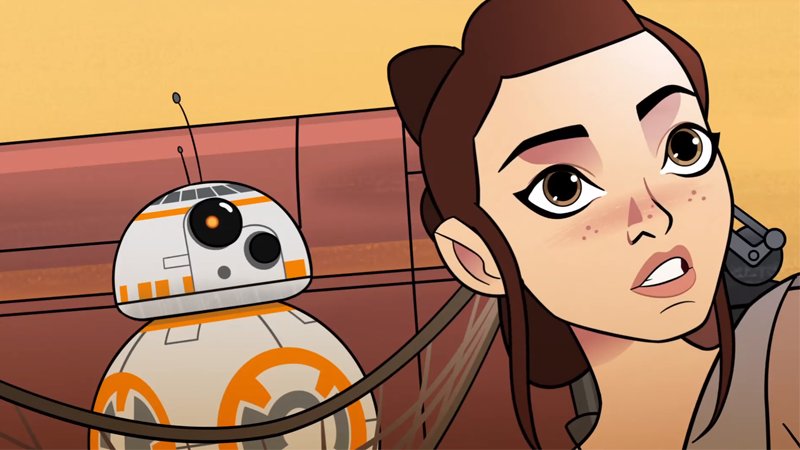 The second episode of Lucasfilm’s new webseries Forces of Destiny is out, and it’s another cute entry featuring Rey and BB-8. It’s also another entry set in the 12-or-so-hour-long period between them meeting for the first time and heading to Niima Outpost to try and find the little droid’s owner. Which means there’s not actually a whole lot of insight it can have to offer, considering that we know everything that happens around this moment. Hell, we know what happens immediately before it too, because we’ve had two shorts set in this tiny period of time. Like we described the first short, it feels less like an interesting story and more like a deleted scene from The Force Awakens. Yes, it’s cute, and yes, it’s always nice to hear more of Daisy Ridley in action as one of the new stars of the Star Wars galaxy. But the combination of the fact Lucasfilm are painfully unwilling to allow new material to really delve into Rey’s character before the events of The Force Awakens, Lucasfilm’s seeming reticence to let the books, games, and comics tell stories not set between and immediately before the films, and the decree that all new material created under the Disney and Lucasfilm era has to be canonically consistent with everything else, leads to fact we can’t really get new, interesting stories for Rey yet, beyond the movies. And that’s despite the fact Lucasfilm clearly wants to do more stuff with the character, because duh, she’s the new face of Star Wars. So we get this, the one 12-hour window that people can work with, a period conveyed with nothing but a classic Star Wars screenwipe in The Force Awakens because, nothing particularly interesting or of note happened in it. Presumably, Rey spent part of that time asleep, so it’s actually even less time to cram short stories or more Forces of Destiny shots into. Will we get an novella about what Rey had for breakfast before she heads towards Niima Outpost in this short? A comic about conversations she had with BB-8 back at her AT-AT abode? Maybe we’ll find out one day. Or maybe, hopefully, The Last Jedi will leave Rey in a place before Episode IX that there’s a time period we will really get to explore with her in mediums beyond the films. Because lord knows how much more they can cram into this one night on Jakku.